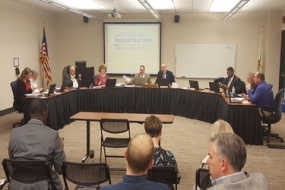 May 16 – The Carroll Center for Innovative Learning has had its inaugural semester and two teachers took time to tell about their experiences with it during Tuesday’s Richland Board of Trustees meeting. Laura Philips teaches various sections of Algebra at Richland. She said at the start of the semester, she tells her students they will learn from three different sources: the instructor, themselves, and their peers. “Learning from their peers is the most important,” said Philips. She said the classrooms in the Carroll Center have allowed her students to collaborate in multiple ways. “When I looked at the traditional classroom I taught in, I noticed it was difficult to mingle,” said Philips. The straight lines of desks made it hard for students to group together to work on homework. Now Philips raves about the tables that seat four students per table. “They also have chairs with wheels on them so if they want to collaborate between groups, they just have to wheel themselves over to help”. She was also pleased with the open floor plan that allows her to easily bounce from group to group to distribute papers and help with problems. Shelly Baldwin, Richland Nursing Program Director and Instructor, said she enjoys having the white boards around the room and having multiple display screens at each table. “It allows me to use the large screen to show a picture or a portion of the textbook and then have various case studies on the small screens,” said Baldwin. She said her students also liked the arrangement of the classroom. Another feature that both instructors mentioned was the seating areas outside of the classrooms. They both said they have seen students lounging at the tables with classmates while working on problems before class and collaborating before they step foot in the classroom.